A pair of ladies’ fashion gloves rest at the bottom of a dresser drawer. I see them at least twice a year when I rotate cold-weather and warm-weather clothes. The gloves are old and worn, a testament to age. They’re also soft to the touch and golden brown, like a newborn fawn. 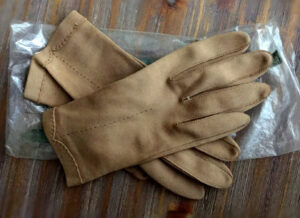 A sporty topstitch runs halfway down the back of the glove and around the top with the scalloped edge. They belonged to my grandmother. A cousin said she had found a stash of Grandma’s gloves and asked if I would like a pair. When the package arrived, I peeked inside and pulled the gloves out of the plastic sleeve in which they originally came from the department store. They looked as though they had been carefully put away. For next time. They’re small, but my grandma was small. Small but sturdy—it runs in the family. At least among the females. The men are big and broad and the women are . . . well, let’s just say long, lean and leggy was not in our DNA. She was a woman who needed sturdy hands and arms for kneading bread dough, butchering chickens and scrubbing wood floors. Delicacy wasn’t all that useful on a farm, not for tending nine children, firing up a wood cookstove or feeding a hungry threshing crew of 20 dirty men fresh from the field, gathered around long makeshift tables outdoors under the locust trees. The hands that slid into those gloves had tended the sick, weeded gardens and washed countless dirty dishes in soapy water. There was a time when ladies of every social and economic class wore gloves when they went out. Gloves were part of the dress code of the day. They’re everywhere in our old black and white photos—gloves along with hats and pocketbooks, boxy purses with fierce clasps that would pinch any child’s fingers should they be messing where they didn’t belong. These gloves put a lovely cover on the hands that fed hobos who rode the rails, wandered through the countryside during the Depression, and occasionally appeared at her kitchen door. They were the same hands that bid farewell to two sons going off to war and held the flag presented in honor of the one who didn’t make it home. She was small but mighty. The story goes that she chased away a young man whom she considered an unsuitable suitor for one of her daughters with nothing but her bare hands and a broom. He later became a son-in-law. I remember being a small girl and seeing those hands grip the steering wheel of an automobile so huge she could barely see over the dashboard. And could those hands fly on a piano. They raced up and down the keys faster than the speed of sight. She could play any song she heard, from hymns to polkas to ragtime. Name your key. She had music in her. And love and grit. The gloves aren’t worth much in and of themselves, but they’re a lovely touch of the past. Just when you thought the world couldn’t get any crazier, Mom Jeans make a comeback. Mom Jeans were a staple of the ‘80s—cinched at a high waistline, generous in the thighs, a broad backside and lots of pleats and tucks on the tummy for room to expand. Think Humpty Dumpty finding relaxed fit at the Gap. Mom Jeans were old-school denim that predated Spandex. They had absolutely no give. 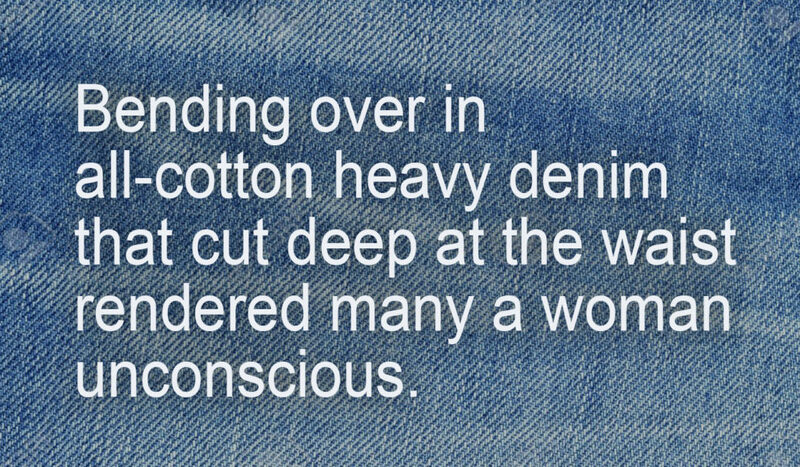 Bending over in all-cotton heavy denim that cut deep at the waist rendered many a woman unconscious. Mom Jeans were a friend to no one, but they provided ample coverage— like an ill-fitting tarp. Eventually, Mom Jeans were mocked, ridiculed, shamed and replaced by a new denim with stretch and a new design. Meet the skinny jean. Skinny jeans brought with them an entirely different silhouette – women who looked like praying mantises—stick legs protruding from long flowing shirts and roomy tunics. The youth culture propelled the skinny jeans to a long stretch (pun intended) of popularity. And now the youth have turned on their own. All the cool, hip stores courting teens and early 20-somethings are touting Mom Jeans. American Eagle touts Mom Jeans claiming, “She’s never been more right about anything than she was about this fit.” One can only assume the copywriter was not alive during the ‘80s. But it’s always good to get credit for something. They got it wrong. There’s never beauty in the breakdown of a mom in jeans. And the destruction is not in the knees, it’s in the wee hours of the morning, when the baby won’t sleep. Destruction is in front of the washing machine when you’re putting in a load of sheets somebody puked on, or in the grocery unable to focus because three kids are hanging onto or out of your cart. The AE model wearing the Mom Jeans looks amazing. The caption says she’s 5’10” (more like 6’ 6” in the stilettos), has a 24” waist and wears a size 2 X-Long. If this woman has borne children, she’s a walking miracle. Trendsetters call them Mom Jeans, but there has never really, truly been a Mom Jean. Authentic Mom Jeans would come with carabineers strapped to the belt loops—one for holding anti-bacterial hand gel and another for pacifiers. They’d have two generous back pockets, one for a cell phone and one for a wallet. They’d also have Velcro tabs on each side, one to hold a small packet of wipes and diapers and the other for Goldfish and Cheerios. True Mom Jeans would make women look like human diaper bags. There’s not a designer alive who would want to have credit for that line of jeans and not a young person alive who’d want to be caught dead in a pair. It is Zucchini Season once again, that delightful window of summer when zucchini are so abundant that people aggressively push them on family, friends and total strangers. Why, I’ve seen people standing on street corners randomly throwing them to passersby. Yesterday a neighbor texted that she was sending her husband down with some zucchini. 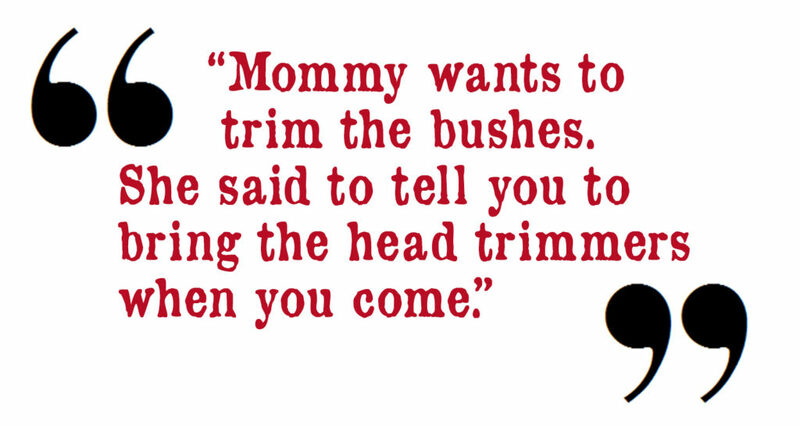 Her exact text was “whether you want them or not.” It read more like a threat than an offer. Zucchini is to the garden what clothes hangers are to the laundry room—you close the door, darkness falls and they multiply like crazy. Nobody ever asks, “How are your zucchini doing this year?” Zucchini are always doing well—their numbers are always up. Zucchini is the vegetable that keeps on giving. And giving. And giving. I have often thought of the Old Testament passage describing Jews wandering in the wilderness living off of something called manna that they collected each morning before sunrise. I have concluded manna was probably a lot like zucchini. If not actual zucchini. Zucchini is not only prolific, it is downright odd. Is there any other food on the face of this planet that people work harder at disguising? Zucchini bread, zucchini pasta, zucchini parmesan. The zucchini is in there somewhere, but you’re going to have to hunt to find it. A friend had some ladies over one afternoon and served a lovely homemade pie. She asked us to guess what it was. See what I mean? And they always say it with a “gotcha!” sort of attitude, like “hey, you really walked into that one.” I don’t know. I find that unsettling—and I always hope those people never get their hands on arsenic. Listen, I’m certainly not one to cast the first zucchini. I made latkes last night and waited until everybody had some to make my announcement. 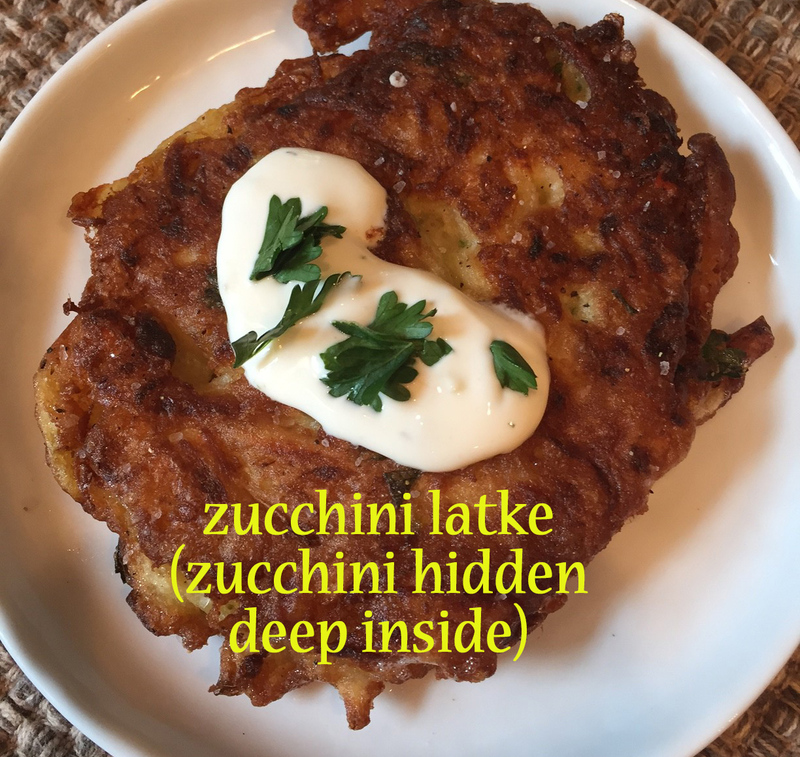 They wouldn’t ever know it because they were basically potato latkes with hidden zucchini. The point is, you cook zucchini with the intention of disguising it. Even people who eat it straight up first sauté it in oil, season it and sprinkle it with cheese. Lest it sound like I am complaining, let me say that zucchini is very versatile. We’ve even used it to teach math. If you have a dozen zucchini and your neighbor asks for one, how many do you have left? None. You unload all the zucchini you can whenever you get a chance.